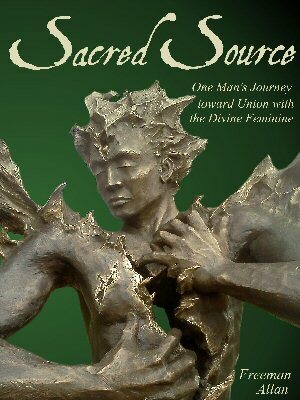 Freeman Allan is best known in the Pagan and New Age communities as the founder of Sacred Source, the go-to supplier for statues and icons and other ritual supplies from a wide variety of pantheons. Quite a few of their pieces have been on my To Buy list for a while now. The cover of Allan’s autobiography exemplifies both that absence and that journey. “The Messenger,” cast by Allan’s son Gabriel, portrays a man with flaming wings and hair ripping himself open to reveal the emptiness within. He, like all of us, like the world, must be torn apart and rebuilt — whole, this time. I have only a few minor quibbles. At nearly five hundred pages, this is a lengthy autobiography; a more careful, ruthless edit would have pared the book down by a good hundred pages. At some point during the book’s development, the subtitle was changed, as well; I am not sure if the interior text was changed, too, so I don;t know if there is more than one edition of the book. Additionally, the black-and-white photographs of Goddess and God statues at the end are nice, but are essentially an advertisement for Sacred Source; it would have felt more natural and harmonious to work those images into the text as Allan referenced those Deities, rather than lumping them all at the end. Recommended to devotees of Kali, Goddess Spiritualists, and fans of Sacred Source everywhere.